Thermae Sylla is truly entitled to its claims as “the only natural spa resort” in Greece, but an even more appropriate characterization would be the continuity of thermal tradition from the time of antiquity. The Thermae Sylla Spa is built on two hot thermal springs, which were already mentioned in the works of Plutarch, Aristotle and Strabon, as the “Herculian Thermae”. It is said that Hercules visited the site when he needed to regain his powers. Today we would say that he was in serious need of revitalization and rejuvenation, all benefits to be expected from a modern spa. The name Sylla was later added and originates from a famous Roman General who decided to build baths for the prominent Roman society of the time. It is believed that the area in which the spa was built was renowned for its healing powers and this is strikingly evident in the local archaeological findings. Today’s Thermae Sylla Spa was completed in 1897 to serve as a medicinal waters resort. The resort attracted an international and cosmopolitan clientele that included Aristotle Onassis, Maria Callas, Winston Churchill, Omar Sharif and others. According to current international regulations, Edipsos thermal mineral springs are ranked on the basis of their physiochemical composition, in the saline spa category. They have a temperature of 70 to 84° for the 1st spring (Edipsos Damaria spring) and of 40 to 50 ° for the second (ThermaeSylla Beach spring) and are rich in valuable minerals and trace elements. Indications of bath therapy, always under a doctor’s supervision, has been used for articulation-related problems, back and neck aches, rheumatisms, gynecological and circulatory related problems, endocrinological cycle disorders (due to the revitalizing effect of radon), and lastly, beauty and rejuvenation. These thermal waters have risen through the rocks from a depth of 3000 meters at a temperature of 75° for the last 20000 years. The fact that the spa is built right over the springs is a challenge in itself as there is a constant need for building maintenance. According to the spa manager, Thermae Sylla Spa clientele has undergone a shift during the last few years. Originally frequented by elderly persons for an average stay of 3 weeks under doctor’s supervision, the resort now attracts a younger clientele of spa goers, especially in winter, in search of relaxation and the benefits of wellness for shorter, weekend getaways. Customized programs designed by a doctor include bath therapy in the internal or external pools or in individual bathtubs, followed by the famous “fango” application, a thermal mud which helps to eradicate back pain and neck stiffness. The program continues with a collection of traditional Asian massages like Thai massage, Ayurveda, Pantai Luar from Indonesia and Reflexology. Pool treatments such as Aqua bike or Watsu are also sophisticated options that cannot be found everywhere in Greece. Kinisiotherapy and Hydrokinisiotherapy are the more medical based treatments offered by the impressive spa menu. 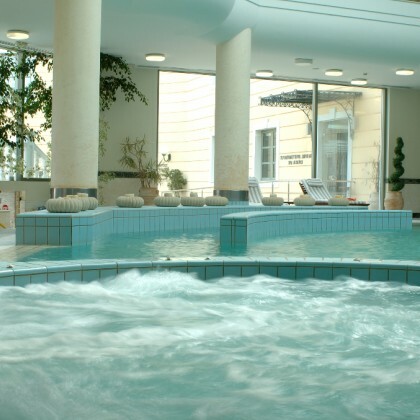 In conclusion, Thermae Sylla Spa is a rarety in Greece with a long history and tradition, an international reputation based on high quality thermal spring waters and a luxury hotel environment. The resort operates year round and is easily accessible by ferry boat or by car from Chalkida. With the blogs I’ve visited online, this is the simply post I’ve ever conclude their excellent composing. The quality of the article explains well the actual discussion. I will be glad that this blogger shared this matter for the visitors. I loved how the tumblr plans their writing high quality. It can be known as a successful work.